Stroll along the white sandy beaches of Lanikai Beach, named one of the top 10 beaches in the world by 2014 Travelers Choice! Only a 5 minute drive from our stunning studio. We are situated on a picturesque, family-friendly road with little road noise and traffic. Breathtaking Kailua Beach is 0.8 miles away and will only take you 15 minutes to walk or 3 minutes to drive. Charming Kailua Town is also only a 12 minute walk away (0.6 miles) where you will find restaurants, shopping and grocery stores. Take a stroll through Whole Foods, try a shave ice with local flavors like Lilikoi, Mango or Pineapple at Island Snow or grab a coffee from Kalapawai Beach Café and walk the beach. You will discover lush, tranquil tropical gardens, a gorgeous lily pond complete with a waterfall and fragrant flowers on the property. The 10,000 square-foot property offers peace and quiet, making it the perfect refuge to come home to after a long day exploring the island. Unwind in the shared sparkling salt-water pool and spa that boasts a waterfall. The unit features Hawaiian culture through stunning artwork, tropical décor with an island feel. The studio unit has 700 square feet of living space with a small garden lanai. Unwind in the chairs on your private garden lanai and get lost in your favorite book. This unit is perfect for guests wanting to cook as it comes fully furnished with a full kitchen: stove, fridge, microwave and private BBQ. A sparkling salt-water pool and spa is available in the backyard for your use along with lounging chairs. After a long day in the Hawaiian sun, you can rest your head on a sublime Queen Bed and cool off with a top of the line A/C wall unit and watch a movie on the flat screen TV. The bathroom has a hand-painted topical sink and stand-up shower. Free WIFI is available so you can keep up with emails and post all of your vacation photos. There is also a shared laundry facility on site and one off-street parking stall. We have bikes, beach chairs, boogie boards and other fun beach items available for our guests to use as well. There is no smoking on site and maximum occupancy for the unit is two. 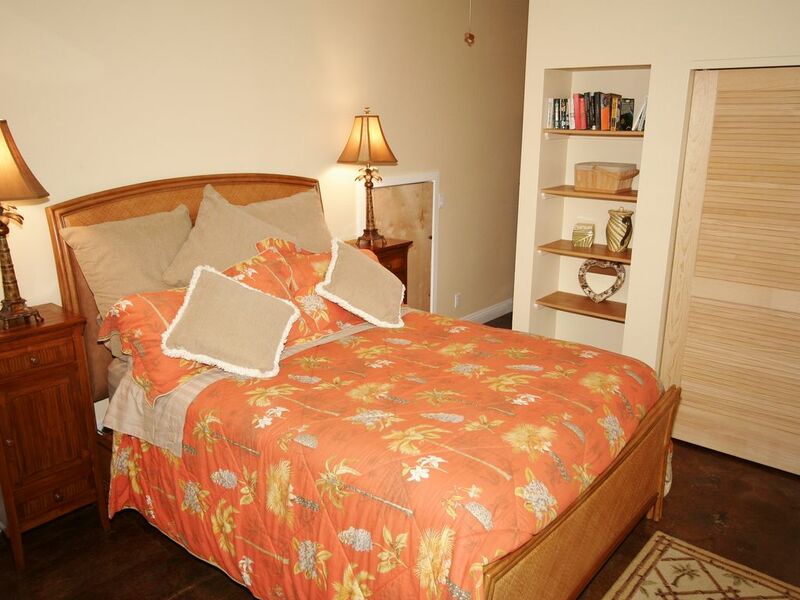 We are here to offer you the best Hawaiian hospitality and assist you in having a wonderful relaxing time here in Kailua! We require a 50% deposit through the VRBO site. All International Credit Cards (Canada included) will be charged an additional 2% fee. Please don’t hesitate to call if you have questions! Mahalo! A hand-painted sink brings the Island life inside. A lovely top of the line A/C has just been installed! One flat screen TV in the studio. A garden lanai and chairs for reading. We were very comfortable in this rental. The backyard pool is AMAZING to come home to after a day of exploring. We loved Kailua, it was so relaxing after four hectic days in Waikiki. This is a good jumping off point to access the Noth Shore which is stunning. Perfect studio. Full kitchen, beautiful bathroom, very comfortable bed. Lovely covered private outdoor space with comfy furniture, lights strung - a cozy place to read or eat dinner at in the evening. Shared backyard is gorgeous with pool, hot tub and lounging chairs. The best beach ever- Kailu- is within walking distance! Awesome for catching the sunrise. The town is in walking distance too. Fun farmers market with tons of food vendors on Thursday evenings. Best holiday ever! Thank you for staying with us and we are so glad you enjoyed your time :) Please come back and visit us soon! Terrific studio personalized with her beautiful artwork. Very nice place with everything we needed for our stay. Great location in Kailua. The bikes available for use was great - 5 minute ride to the beautiful beach. Accommodations were clean with extra amenities that made our stay extraordinary, the area was charming with many eateries and quaint shops, and the hostess was very quick to make sure we had everything we needed. Thank you for your hospitality and for being a part in making our trip perfect! We would definitely stay again when we come back. Stroll along the white sandy beaches of Lanikai Beach, named one of the top 10 beaches in the world by 2014 Travelers Choice! Only a 5 minute drive from our stunning property. We are situated on a picturesque, family-friendly road with little road noise and traffic. Breathtaking Kailua Beach is 0.8 miles away and will only take you 15 minutes to walk or 3 minutes to drive. Charming Kailua Town is also only a 12 minute walk away (0.6 miles) where you will find restaurants, shopping and grocery stores. Take a stroll through Whole Foods, try local flavors like Lilikoi, Mango and Pineapple on a shave ice from Island Snow or grab a coffee from Kalapawai Beach Cafe and walk the beach! The unit features Hawaiian culture through stunning artwork and tropical décor with an island feel. There is also a shared laundry facility on site and one off-street parking stall. We have bikes, beach chairs, boogie boards and other fun beach items available for our guests to use as well.